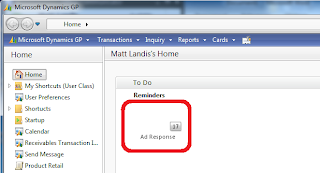 Reminder Cues are a very nice new feature on GP 2010 that gives you a visual cue as to how many items are returned in a Homepage Reminder. 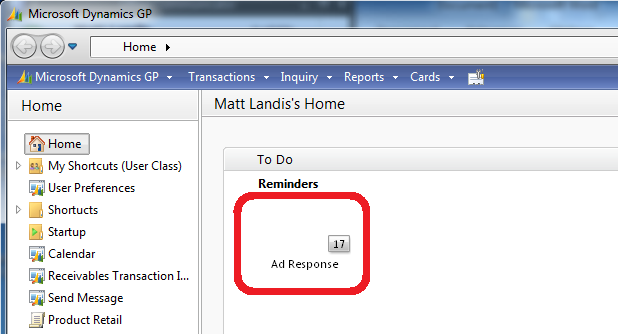 I’ve been noticing ever since GP 2010 Beta that on our systems the little stack of papers is Missing! We just installed GP 2010 at our site and Urggghh…they are still missing! Hmmm...we have all Windows 2008 64bit, all Windows 7 Pro 64bit workstations...Office 2010 64bit...and I'm hearing rumblings there are some warnings about 64bit Office too. PS-I just noticed another issue with Cues on Windows XP Pro 32bit: Reminder Cues only seem to appear for "Predefined Reminders" and not for "Custom Reminders". If anyone has anymore to say about this or a solution I'd love to here it.